The city reaffirmed recently it's not in love with the plan to place industrial land where they want residential. Despite some pointed comments regarding Metro's decision to allow industrial rather than residential development to occur on 42 acres of future city land, the Tualatin City Council has agreed to move forward with adopting the next step in finalizing the Basalt Creek concept plan. July 27, the council directed its staff to come back with a resolution to adopt the plan that will guide future land use and transportation decisions for the Basalt Creek Planning Area. Councilor Joelle Davis was the lone dissenting vote. The land in question is 847 acres of property located in Washington County between Tualatin and Wilsonville. Several property owners testified that the most recent decision — industrial vs. residential development — will create a gap for needed housing. One of those was Peter Watts who told the council that Metro at one point in its documentation of the property noted that there was no need for industrial land in that area. Watts said that residential property will be badly needed as Tualatin continues to grow. Tualatin has held that those 42 acres of developable land in question, which contain rugged topography and uneven bedrock, is best served with residential development. 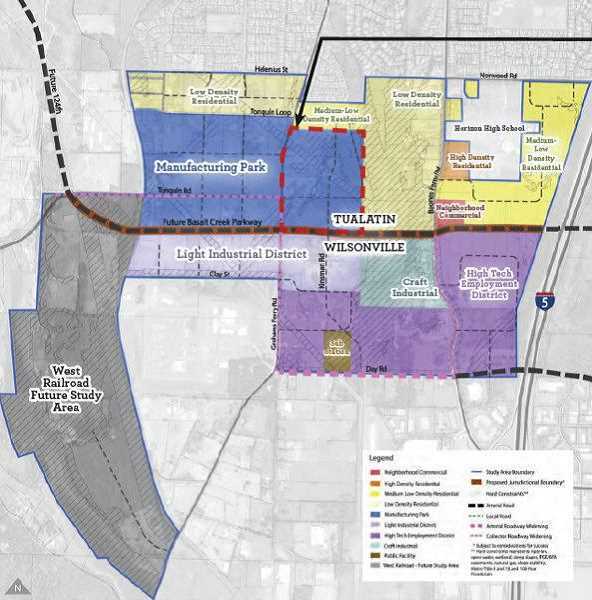 However, the Wilsonville City Council has said it should be earmarked for future industrial development. "We've been down a very contentious trail in this whole process," Tualatin Mayor Lou Ogden said about determining a designation for the property, stressing that the council still is not in favor of it being used for industrial needs. However, he said Tualatin agreed earlier to a four-party agreement between the city, Wilsonville, Metro and Washington County that allowed Metro to be the final arbitrator on use of the property. That decision was made several months ago by the regional government for the land, located south of the Victoria Gardens subdivision, north of Basalt Creek Parkway and east of Grahams Ferry Road. "For reasons beyond my comprehension, Metro designated it as employment land," said Ogden, a decision he said he felt was made without any "credibility." The Tualatin City Council will vote on a final concept plan at its Aug. 13 meeting. The concept plan includes 194 developable acres for the City of Tualatin and 137 acres for Wilsonville in the Basalt Creek Planning Area. Of those, Tualatin will end up with residential development consisting of 575 households while Wilsonville will have only six.